Interview with Mr Stonegoat, Goat. A spoken word segment rises to the surface on the intro of the beguiling instrumental cut ‘To Travel The Path Unknown’; resonating powerfully across the trance-inducing rhythms of the Swedish collective’s latest, sophomore full-length, ‘Commune’: “There is only one true meaning in life/And that is to be a positive force/In the constant creation of evolution.” is uttered meaningfully before gorgeous guitar tones and warm percussion fade gradually into the mix. The title of the guitar-led instrumental (reminiscent of The Allah-Las or The Byrds) serves the perfect embodiment to Goat’s spiritual journey thus far. A path steeped in a cosmic spirit. The album opener ‘Talk To God’ sees the band immediately arrive upon the transcendental state of mind. Majestic guitar lines and shape-shifting rhythms ascend into the atmosphere. The journey’s starting point is closely connected to its predecessor ‘World Music’ as similarly transcendent moments fill the space. Themes of life and death flicker beneath the intense vocal delivery and sublime guitar lines. A Tropicalia feel permeates ‘The Light Within’ as raging guitars (wah effects dazzle like the burning sun) and chant-like vocals takes you to another place. 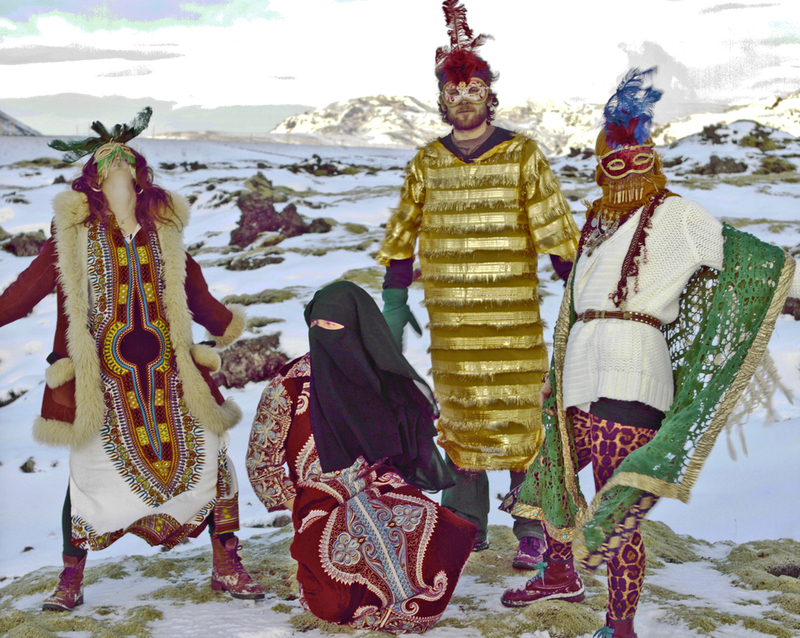 ‘Commune’ is undeniably the lost brother to Goat’s enchanting debut of ‘World Music’. ‘Goatchild’ contains an irresistible bass-line groove and psychedelic guitar haze with an utterly compelling vocal inter-change between the Goat lead-vocalists (think Nancy & Lee inter-woven with The Doors). 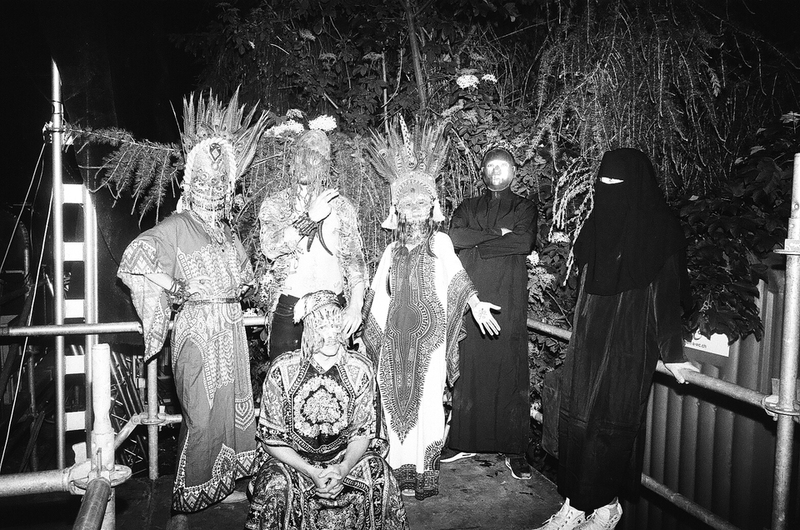 The bewitching track was featured on the band’s live album, ‘Ballroom Ritual’; a live concert that took place in Camden’s Electric Ballroom on the eve of their Glastonbury performance back in 2013. Elsewhere, lead single ‘Hide From The Sun’ is a pristine cut of psych bliss that delves magnificently into Afro Beat rhythms and 60’s psychedelia. The closing tracks of ‘Bondye’ (a supreme instrumental that is built on hypnotic rhythms and Jimmy Page-esque guitar) and tribal delights of ‘Gathering Of Ancient Tribes’ bring ‘Commune’ to a fitting close. ‘Commune’ is out now on Sub Pop Records (USA) and Rocket Recordings (UK & EU). Congratulations on the stunning new record, ‘Commune’. It’s such a pleasure to ask you some questions about the latest spiritual journey of Goat, following on from the mesmerising debut of ‘World Music’. What is immediately striking is how both albums effectively occupy the transcendental state of mind, where the songs capture a sense of togetherness, love and age-old traditions of life. How do you see ‘Commune’ fits alongside ‘World Music’? Also, I can imagine the extensive tours this past year (and the embracing audiences from the world over) must have tapped into the new music in some way, particularly the energy of the shows? Mr Stonegoat: I can honestly say that I don’t know. I guess that everything that happens in our lives affects how we make music but in what way I can’t say now. Maybe its too early. And how Commune fits with WM? For me the albums are similar. We have developed our skills in the studio so I think that the sound is better. And I also think we found a more spiritual approach in the lyrics this time. But they feel like sister or brother, or maybe mother and father. So we gonna have to give them a kid. One of the great hallmarks of the Goat sound is the earth-shifting rhythms the collective unleash. I would love to gain an insight into this aspect of the music, and indeed the spiritual element inherent in your songs. 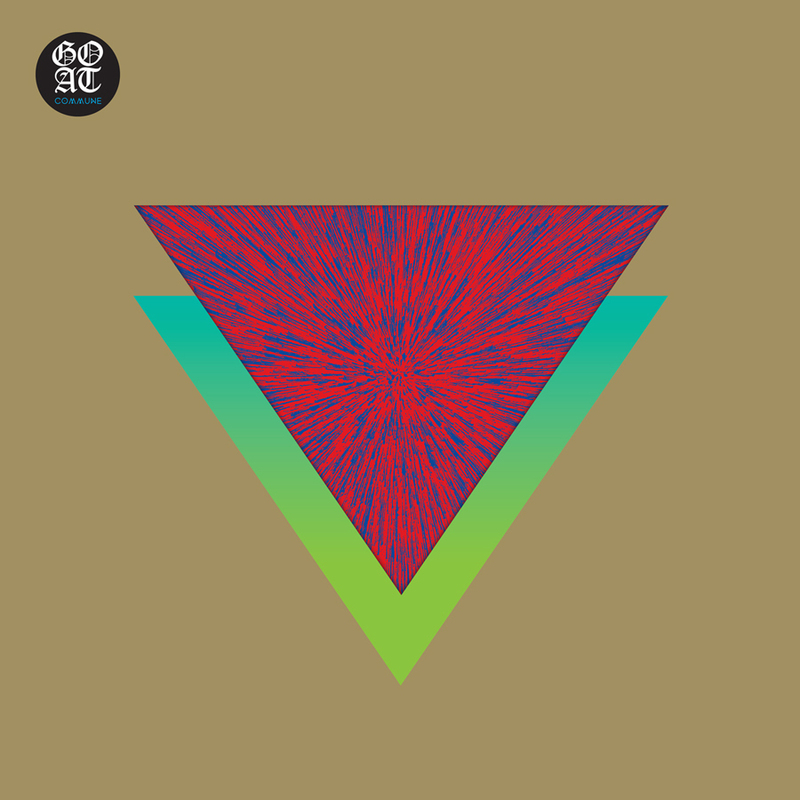 Psychedelia is one sphere of sound that Goat gravitates naturally towards. Can you please discuss the meaning and importance of this world of music and what path do you see Goat belonging to? Mr Stonegoat: We just find rhythms interesting to explore in music. There are so many rhythms the world to try out. And we love to play with drums so our music naturally circulates around rhythms. And the spiritualness I guess partly come from our past and also our openness and curiosity towards religions and spiritual philosophy. But I don’t think Goat belongs to anything else than itself. We follow our own path within the path of evolution we all follow. Can you talk me through the studio-set up for the recording sessions of ‘Commune’? Is it the very same Analog studio in which you recorded ‘World Music’? Have any techniques or processes changed in any way from the predecessor? Mr Stonegoat: It’s the same studio with the same equipment. More or less. But we have become better in handling the stuff we got. Mr Stonegoat: I guess that sentence says most of it. Everyone needs to understand that we are all part of many various collectives. To make your life meaningful you need to play a positive role in them. That is what drives everything forward. We value togetherness between all people of all cultures. Let everything enrich each other. And we hope for the world to soon make a spiritual leap forward. It will come but I hope it comes soon. We are pretty close I think. One of my current favourites is the glorious ‘Goatchild’ that has wonderful shades of Allah-Las with the majestic harmonies. I love the dialogue that flows between the various singers that feels akin to Sun Ra and his ensemble of musicians. Please recount your memories of recording this song to tape? It feels the songs simply flow out of you – at once it’s an effortless process – were these songs written while on tour? Is a song given its wings, so to speak, in a relatively short period of time? It feels that once a spark of an idea or inspiration comes to light that the rest follows very naturally and rapidly. Mr Stonegoat: You are right about that when an idea comes we jump on it and finishes it very quickly, often within hours. But I have no memory of this one since I don’t recall being part of its recording. I think it was just written from a jam as most of our songs are. The collective identity rather than the identity of the individual is what the essence of the band is, and always has been. Please trace the collective’s inception to first creating music and the importance of traditions and beliefs from your commune and how this feeds into the music you create? Mr Stonegoat: I can’t do this really, it’s too much to ask for. I don’t wanna analyze it this far. It feels destructive to dig too much in it. I wanna keep my thoughts and mind out of our music as much as possible. Lets just say that everyone’s past always is with them and effects all that you do. What bands and records have you been obsessed with of late? It must be very special for the collective to be playing concerts around the world to rapturous applause and adoration. What is next for Goat? Where do you see the music exploring to next? Mr Stonegoat: I don’t know and I prefer not to think of it at all. Its better to let it float freely. But wich bands we have been listening to lately..? I guess we have been rehearsing and playing so much lately so we havent had time to get into anything new. But soon we will have time off and can start build on creativity again. I just got some Cds sent to us from Sub Pop so that is what I’m listening to right now. Nice with some music I have never heard of before. It was j Maskis solo album, Mirel Wagner, King Tuff, Shabazz Palaces, and Lee Bains so this is what I am gonna try and dig for the next couple of weeks.